This week was the first time in a long time that I have been able to enjoy Nepali sports. The last few years following domestic sports was just not fun. Everything sports related was either dogged by incompetence, scandal or politics. All that has not suddenly disappeared, but with the start of the Martyrs League football tournament after a 3 year hiatus and Nepal hosting an ICC level tournament for the first time - the Nepali sports scene does seem to be coming out of hibernation. Yes, the quality of both the Martyrs League and World Cricket League is very poor compared to what we can find on ESPN and StarSports, but the games can be just as exciting. The beauty of sport is that when you have two evenly matched teams, no matter what their level, usually it is an exciting affair. Add some rooting interest - the Nepal National Cricket Team and Machhindra FC in my case - and suddenly the adrenaline goes up several notches. For the said reason, in general I find it unnecessary to harp on results too much. You win some, you lose some and sometimes you lose a ton. We do not need the Martyrs League to be the Premier League or for our Cricket Team to rival India immediately. What we do have the right to expect are regular competitions and our officials and sportsmen giving it their all. That has been the major issue with Nepali sports recently - instead of playing we are fighting, stealing and making excuses. I was all set to post a piece I had written about the Winter Olympics but changed my mind at the last minute. This morning I got a case of cricket fever. I was pleasantly surprised to find the running score of Nepal's match against Jersey in the World Cricket League on a Nepal1, the only Nepali TV channel available here in Hyderabad. Immediately, I went searching for Internet links to the game and found that the ICC has a great section dedicated to the tournament with lots of features, photos and videos from Kathmandu. There are also a few prominent Nepali cricket blogs where one can follow the tournament. The Cricket Association of Nepal website is hopeless - I don't think they update it anymore. The tale of the websites (and Nepal1 TV) reflects the story of Nepali cricket - great interest, great potential, but an underwhelming Association - an opinion that is shared by a few friends I have that are very close to Nepali cricket including some National Team players. But I remain very positive about Nepali cricket. Unlike Nepali football, those associated with cricket in Nepal have a slightly higher IQ and are capable of moving the sport forward. The technical nature of the game makes it possible to quickly be competitive. Our greatest asset is our geography – cricket’s super power and cash cow is right next door to us and we have the strongest cultural, social and economic ties to them of any country in the world. If you are really starved for more commentary, be sure to also follow Rangasala Blog on Facebook or Twitter where I post additional news, views and links. Thank you all for your support (and criticisms). I'm having a lot of fun with this and I hope somehow the blog is making a positive contribution to Nepali sports. 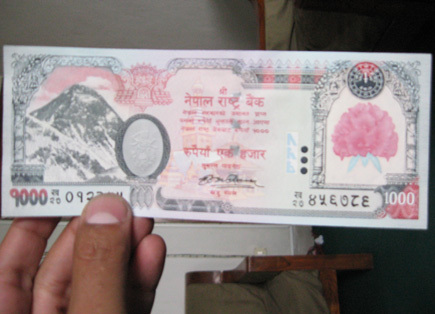 In my last trip to Nepal I noticed how afraid sports persons were to use the "M" word - money. They would talk at length about various sports ideas they had, but never would you hear words such as profit, income, salary and business. It's like profiting from sport in anyway is a deadly sin in Nepal, which is quite ironic as that's what most of our sports officials are doing under the table. Perhaps if we were more open about making a good living through sports we would witness less of the shenanigans we currently see in the sports sector. I have heard stories as low as one sports official watering down orange juice for youth players so he could save a few rupees for himself. Stealing and corruption is wrong, but being entrepreneurial or getting paid for handwork is right and should be promoted. If officials are doing a great job, they deserve a salary. If a sportsman has a business idea related to sport they should receive our encouragement. A thriving sports economy visa-vi player agents, sports marketing agencies, sports academies, etc. will only enhance Nepali sports. It will bring increased professionalism to the sports sector and create a much needed job market for those in the sports sector. Making money through sports is a good thing. Mens football = MAHA FAIL! Ganesh Thapa and company really need to reevaluate ANFA's development strategy. Please stop blaming referees and the lack of a short, 3 month long, league. Nepali media coverage was quite good. The journalists seemed to be on top of all the news. How amateur were the organizers? Marathon circuit 5km short, upside down Nepali flag, wrong national anthem, etc. What are your thoughts on the Games?